Climate change in the Arctic. Permafrost is not necessarly nermanent. Climate Change in the Arctic. Permafrost is Not Necessarly Permanent. The average temperature in much of Alaska and the Arctic regions of Canada, Russia, etc. is sufficiently low that part of the ground remains frozen year around. Permafrost is defined as "subsurface earth materials whose temperature remains below 0°C continuously throughout two consecutive years." 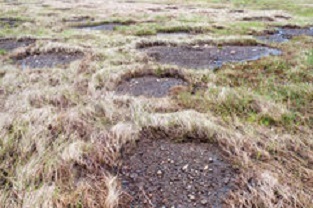 Permafrost generally contains immense amounts of carbon contained in organic matter. This is what remains of once-living plants, which -- while alive in the ancient past -- took in carbon from the atmosphere. They died, and then froze -- trapping the carbon inside. When the permafrost layer thaws, it releases carbon into the atmosphere in the form of gasses. This 2°C goal was established by the Paris Agreement and is now accepted by every country in the world with the exception of the U.S. President Donald Trump has declared global warming to be a Chinese government hoax, motivated by a desire to harm U.S. industry, and is disengaging the U.S. from the Paris Agreement. Scientists believe that if all of the permafrost areas of the world were to defrost, it would eventually triple the level of carbon (C) in the atmosphere, in the form of Carbon Dioxide (CO2), Methane (CH4), and other gasses. That would greatly accellerate global climate change. That causes increased global warming. Return to Step 1, with a vengance. Fortunately, it will take millenia to thaw-out all of the permafrost, even if the temperature rise goals of the Paris Agreement are not met. Also, even if all the permafrost is thawed, the greenhouse gasses will likely not cause a catastropic runaway temperature rise like what happened on the planet Venus -- the next planet from Earth towards the Sun. Its surface temperature is high enough to melt lead. However, it would make more parts of the Earth unliveable and cause more animal species to either migrate, die off, or both. The term "greenhouse gasses" is used because they function like an actual greenhouse: They let sunlight through to the Earth but prevent heat from the Earth's surface from returing to outer space. Scientists have reached a concensus that CO2 and other greenhouse gases are the primary cause of climate change/global warming. Many religious conservatives, executives in the fossil fuel industries, and the politicians whose support the executives have purchased, disagree. Some believe that global warming is not happening. Others believe that it is real but is not caused by human activity, and thus cannot be prevented. There are many greenhouse gasses in the atmosphere: Methane, Nitrous Oxide, Carbon Dioxide, etc. Of these, CO2 makes the greatest contribution to the greenhouse effect. Methane does not last as long as CO2 in the atmosphere as carbon dioxide does, However, it has a far greater heat-trapping ability and thus also is a major contribution to global warming. "... has all kinds of consequences both locally for this [Arctic] region, for the animals and the people who live here, as well as globally. It’s sobering to think of this magnificent landscape and how fundamentally it can change over a relatively short time period." "... one of the big questions to tackle -- what’s wet and dry now, and what will be wet and dry in the future. If the decomposing permafrost is wet, there will be less oxygen available to the microbes, so they will produce more methane. If the permafrost is dry, the decomposition will lead to more carbon dioxide." "In addition to greenhouse gas emissions, thawing wreaks havoc on infrastructure, causing slumping of land when ice loses volume as it turns to water. An additional problem posed by melting of the permafrost is the release of mirobes that have been frozen there for tens of thousands of years. In 2016-AUG, an outbreak of anthrax in Siberia sickened 72 people and killed a 12-year-old. Health officials traced the infection to long-dormant antrax microbes in the corpses of ancient dead reindeer and other animals. There is a possibility of smallpox bacteria emerging somewhere in the future from the permafrost in the same way. "Permafrost is the place to preserve bacteria and viruses for hundreds of thousands — if not a million — years. It is dark, it is cold, and it is also without oxygen. ... There is no [ultraviolet] light. All the bacteria need is a thaw to wake back up. If you take a yogurt and put it in permafrost [that remains frozen], I’m sure in 10,000 years from now it still will be good to eat. ... We could actually catch a disease from a Neanderthal’s remains, which is amazing."